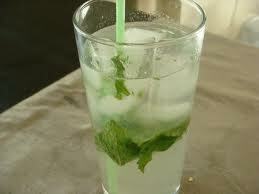 First of all muddle the mint sprigs and lime wedges together with a sugar substitute in the bottom of a tall glass. Once the ingredients are well mixed, fill the glass with ice. Add white rum and club soda and stir well. enjoy your mojito ! How To Make A Mojito: apple-mojito.